Whedon's smart, densely plotted, fast-paced story provides ample opportunities for characterization, revealing the pain beneath the characters' defensive humor. 119 min. Universal Pictures. Director: Joss Whedon. Cast: Nathan Fillion, Gina Torres, Alan Tudyk, Morena Baccarin, Adam Baldwin. Joss Whedon, the creative force behind Buffy the Vampire Slayer, has a loyal cult audience, but even they couldn't save his 2002 series Firefly from cancellation after 11 episodes, several of which never even aired on FOX. The improbable existence of a big-screen Firefly feature, Universal Pictures' Serenity, speaks volumes about Whedon's pluck and talent. Taking a similar tack to Star Trek creator Gene Roddenberry's concept of space as the final frontier, Whedon wittily blended the science-fiction and western genres. 500 years in the future, a bunch of loveable space-cowboy outlaws crew a ship called Serenity, which runs cargo and provides getaways from survival-of-the-fittest heists pulled by Captain Mal Reynolds (Nathan Fillion) and his motley crew. In the first of several cheeky self-references, Whedon unfurls much of his backstory in a film-opening children's lesson. Ever since an ugly war for dominance, the galaxy has been ruled by the unjust Alliance (a sinister bureaucracy that's the opposite of Roddenberry's Federation). The Alliance wants one of Mal's passengers, a problem that raises the stakes considerably and sets off potent political allegory. The passenger is River (Summer Glau), a telepath whose shadowy time in government custody appears to have left her a human biological weapon. River's fiercely protective brother Simon (Sean Maher) is a doctor, making him almost as useful to Mal as he and River are dangerous. The crew proper includes Mal's second, Zoe (Gina Torres), who fought alongside him in the ill-fated civil war; Wash (Alan Tudyk), ship's pilot and Zoe's husband; Jayne (Adam Baldwin), an unpredictable roughneck whose priority is his own safety; and Kaylee (Jewel Staite), a grease monkey with a heart of gold. Two other characters round out the original cast, all of whom reunite in Serenity: itinerant preacher Shepherd Book (Ron Glass) and high-class courtesan Inara (Morena Baccarin), who shares a "just do it already," long-distance romance with Mal. The crew faces a very real danger in The Operative (Chiwetel Ejiofor), a ruthless representative of the government's interest in River. Though he believes in a "world without sin," he confesses to being evil. He's brutally efficient in hand-to-hand combat (proven by two pounding fights with Mal), but proves to have more dimensions than anyone, including himself, might have guessed. The Operative is charged with keeping mysteries secret, but the ordinarily self-protective crew become righteously convinced that those secrets should be revealed, with the help of videohead Mr. Universe (David Krumholtz). Without straining the imagination, audiences will be able to read an autobiographical streak in the conflict of heroes (Whedon and friends) trying to get the word out in the face of authoritative resistance (network TV executives), but the ethic "If you can't do something smart, do something right" just as easily lends itself to modern political allegory: oppressive, scandalous, secretive governments have yet to go out of style, and whistleblowers are expected to sacrifice themselves in the process. In the science-fiction category, Whedon answers the misbegotten notion of "trying to make humans better" with a flawed but deeply loveable cast of characters. True to Firefly form, Serenity undermines most of the usual tropes of science-fiction adventure. Whedon stays true to the retro-futuristic patois of his 'verse (good="shiny"; bad="gorram" fill-in-the-blank), and he continues to give unusually rich and limitless roles to women. Handheld camerawork, dramatic zoom-ins, and mostly silent outer-space effects shots give Serenity a queasy realism occasionally jolted by the unexpected. By the story's climax, Whedon has cultivated the thrilling sense that anything can happen; instead of treating his baby with kid gloves, the writer-director goes for broke. Whedon proves up to his big-screen tasks, enjoying fights, chases, and gunplay but wisely relying on a cast with practiced chemistry (the director lovingly introduces his crew in one lengthy, limber tracking shot). As a result, Whedon's smart, densely plotted, fast-paced story provides ample opportunities for characterization, revealing the pain beneath the characters' defensive humor. Newcomers to the franchise may struggle at first, but the effort will be rewarded by Whedon's adventurous science-fiction actioner, suffused as it is with the strange poetry of love. 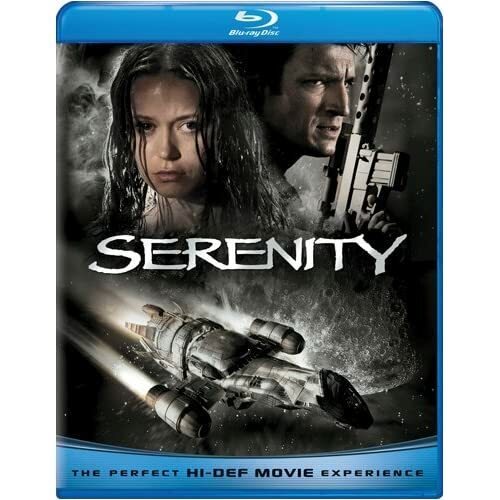 Science-fiction fans will think they've died and gone to heaven when they pick up Universal's Blu-ray of Serenity. For starters, the image retains the film's theatrical look without compromising the busy image: colors and black level are spot-on, the fast-moving action never threatens to break up, and the level of detail is excellent. The picture quality is complemented by a potent DTS-HD Master Audio 5.1 mix that will shiver your timbers with the exciting surround sounds of space piracy. The Blu-ray is filled to burstingwith bonus features, some of them exclusive to hi-def. There's a densely detailed feature commentary with writer/director Joss Whedon, one that fans will happily devour for its warmth, wit and openness. The Blu-ray also offers a freewheeling visual commentary (also available as audio only) with Whedon and cast members Nathan Fillion, Adam Baldwin, Summer Glau and Ron Glass. No stone goes unturned from the points of view of the cast, with Whedon as their happy, humble host--humble especially when he must sheepishly defend himself for killing off one of his co-commentators (with a promise that if Serenity gets a sequel, the actor will also return in some form). Also under the disc's U-Control menu are a Picture-in-Picture track constructed of interview clips, behind-the-scenes clips, and design art; an interactive Digital Tour of Serenity that's a navigable floor plan with stats; and Mr. Universe's Compendium, which presents "Decrypted Files" and "Intercepted Transmissions," text-based documents like Wash's flight training report or a prayer-like invitation from Book's Haven. The Alliance Database presents further info, categorized by System ("Explore local planets and moons and their relationship to the fugitives and the asset"), History ("The Colonization," "Union of Planets," "Unification War"), Classified, and Dossier ("Profiles of citizens related to the pursuit of the fugitives and recovery of the asset"). Next up are 9 don't-miss "Deleted Scenes" (13:54 with "Play All" option, in SD, with optional commentary by Whedon) and a riotous reel of "Outtakes" (6:04, SD). A series of featurettes digs yet more deeply into the film's making. "Future History: The Story of Earth-That-Was" (4:32, SD) allows Whedon to explains the worlds of the film, their history and his inspiration. "What's in a Firefly" (6:33, SD) focuses on bringing the film to life through judicious use of special effects blended with more practical ones. Whedon, executive producers Chris Buchanan and Alisa Tager, CG supervisor Emil Smith, producer Barry Mendel, Loni Peristere of ZOIC Studios, and visual effects supervisor for Rhythm & Hues Bud Myrick comment. There's a humorous "Joss Whedon Introduction" (3:54, SD) prepared for an early "Browncoat" fan screening of the film, as well as 4 "Extended Scenes" (6:14 with "Play All" option, SD). In "Take a Walk on Serenity" (4:06, SD), Whedon, Fillion, Tudyk, and Baldwin each give walking tours of the sets. The most in-depth making-of featurette, "A Filmmaker's Journey" (19:55, SD), features Whedon, Mendel, Buchanan, Fillion, Glau, Staite, Torres, Baldwin, Tudyk, Maher, Baccarin, Glass, Tager, stunt coordinator Chad Stahelski, co-stunt coordinator Hiro Koda, and editor Lisa Lassek, as all aspects of the production get a look (we also get to eavesdrop on what seems like the most joyful table read ever). "The Green Clan" (3:07, SD) allows Whedon to introduce cinematographer Jack Green and his team, made up primarily of his own children. Universal also thoughtfully includes a suite of shorts called "Session 416" (8:00 with "Play All" option, SD) that I assume debuted as webisodes to promote the film. Lastly, the disc offers a BD Live hookup to more, downloadable exclusive content. Obviously, fans will love this disc, which upgrades the DVD Collector's Edition with several new features and a stellar A/V transfer. All site content © 2000-2019 Peter Canavese. Page generated at 04/25/2019 03:31:00PM.